Brand & Marketing Director Nadia Pessarossi, Director and Senior Partner Guy Earnshaw and Financial Manager Natasha O’Connor at the My Business Awards. Photos: Supplied. 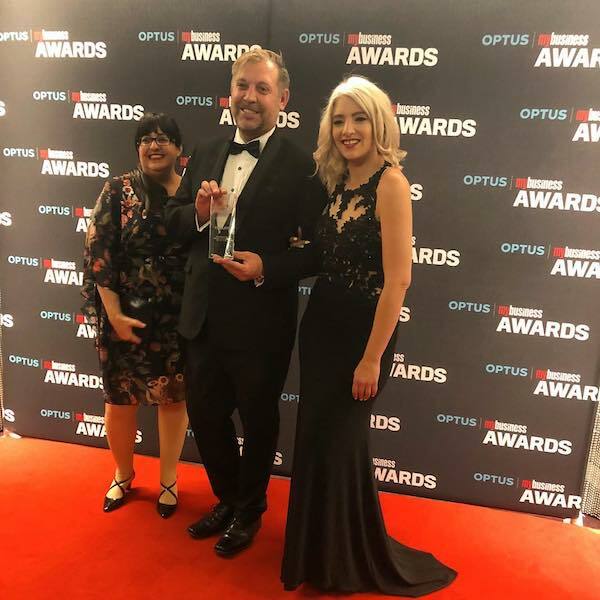 A Canberra professional services firm which set a high bar for client and community achievements when it launched in 2014 has been named Australia’s number one start-up. Rubik3, which began with two people and now employs more than 100, won the prestigious Australian Financial Review award and a swag of other distinctions over the past two months. Rubik3 is 50 per cent Indigenous owned; Indigenous Director Michael Bryne is proud of his Ngunnawal heritage and Rubik’s commitment to projects such as the Indigenous Reading Project (IRP) has helped shape its spectacular formative years. Indigenous Director Michael (Mick) Byrne and Director and Senior Partner Guy Earnshaw at the Australian Company Growth Awards. Rubik3 finished Number One Start-Up in Australia, was ranked 13th in the AFR’s Fast Starters list and 56 in the Top 100 Accounting Firms. The Canberra high-flyer was also a finalist in the Australian Growth company awards; in the Company to Watch Growth category. The awards celebrate excellence in the mid-market, recognising companies that demonstrate high rates of growth, innovation, integrity, contribution to their community and sustainable growth. Rubik3 was also a finalist in the MyBusiness Awards Optus in the category of Professional Services Firm of the Year. Delivering financial management, project management and ICT sustainability services to government and private sector organisations, Rubik3 is doubling its turnover every year. This year it grew by a stunning 130 per cent. The business plans another year of swift expansion, before consolidating in 2020. Information technology is driving much of the growth, and it is focussed on change management. Rubik3 is leading the ICT Change Management sector. Director and Senior Partner Guy Earnshaw says there is no other business like Rubik3. “In every business, it is important to grow. We didn’t 100 per cent plan for such fast growth – it is a testament to our energy, professionalism, team and good old fashion customer service,” Mr Earnshaw says. “We have such strong values and our clients see this and enjoy working with us. We don’t work for people, we work with them so that they can achieve great business success,” he says. Public recognition from these awards has delivered a great deal of satisfaction and acknowledges the hard work of the Rubik3 team. “There is nothing wrong with being proud of what you do and to sit back and say, ‘Wow, what we are doing is awesome, but guess what? We can do better!” Mr Earnshaw says. “The recognition from these awards is helpful for building our brand. The Rubik brand is becoming synonymous for working hard to achieve goals for our clients, and for our community. “We give back and we have done so from day one,” Brand & Marketing Director Nadia Pessarossi says. “The more people know about Rubik, the better, it builds our business and brand, and consequently we can build our clients. Many people start a business and wait until it reaches a certain profitable point before contributing externally. Not so with Rubik. 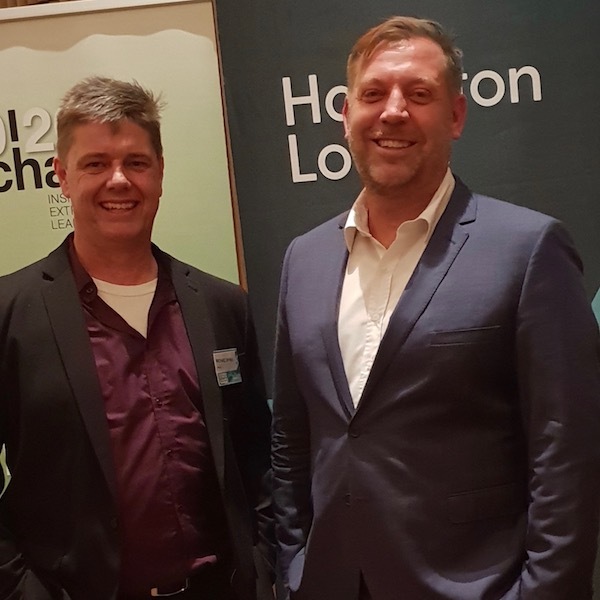 “We gave back from day one, for example, working pro-bono for a number of not-for-profits in bookkeeping, tax and advisory,” Mr Earnshaw says. Rubik advocates heavily for equality within the wider community. In recruiting staff, Rubik looks for energy, passion and drive, and values most a new recruit’s enthusiasm. “If someone has that all-important enthusiasm then we will bring them on board,” Mr Earnshaw says. “Everything else will come with training, but you need enthusiasm to truly achieve,” he says. Acquisitions will become an exciting option for the high-achieving Rubik3 into the future. ALDI named most trusted brand in Australia: Who’s your favourite?